In the past the AIARE 2 was designed to be an entry level professional course. The redesigned AIARE 2 is designed specifically to meet the needs of advanced recreational students who have taken an AIARE 1 and Avalanche Rescue class. The AIARE 2 provides backcountry leaders the opportunity to advance their avalanche knowledge and decision making skills in more complicated situations such as being a leader within a small travel group, traveling in more complicated terrain, and/or developing a travel plan where online resources are scarce. Students will describe and discuss weather, snowpack and avalanche processes, and identify how these processes relate to observations and travel within avalanche terrain. For more information call White Pine Touring at 435-649-8710 or email us at shouse@whitepinetouring.com. Park City-Based: Thanks to our unique partnership with Park City Powder Cats & Heli-Ski and Thousand Peaks Ranch two full days of fieldwork are spent at Thousand Peaks Ranch – providing students with true backcountry learning experiences. 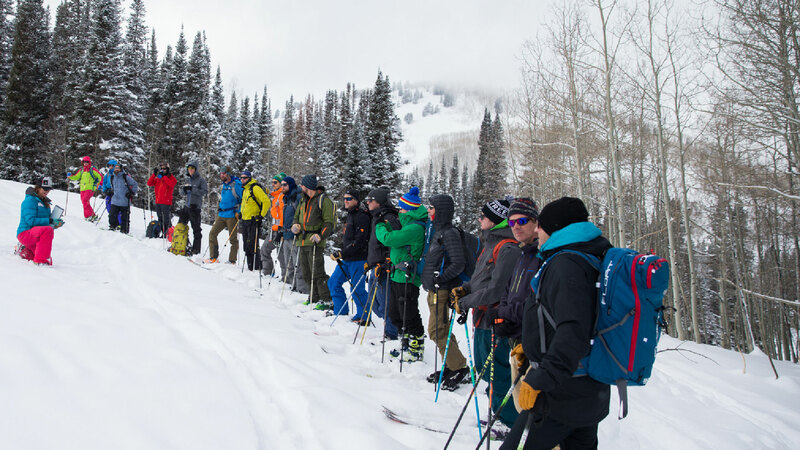 We would like to thank our partners for helping ensure that AIARE 2 students in the Wasatch Mountains receive the best possible avalanche education. For more information, please visit Park City Powder Cats & Heli-Ski, pccats.com. SYurt-Based: This will be a backcountry-based avalanche course staged out of our Castle Peak Yurt. Students will spend two nights and three days at the Castle Peak Yurt in the Uinta National Forest. The course fee includes lodging at the yurt, all necessary equipment rentals, as well as breakfast and dinner for the two nights at the yurt. Students will be responsible for their own lunches.